A monster of the prehistoric world is revealed! It's Tyrannosaurus Rex is a nicely illustrated title in Oceanhouse Media's Smithsonian Collection - a series based on popular non-fiction print titles about the natural world. The print version of this title was released in 2004 along with an audio CD. As a book app, this title sparkles, giving enormous value over its print counterpart, including narrated text that highlights as read. This book series fills a great need for digital book apps with non-fiction educational content. The books selected so far have been well vetted as print titles, making it easy as parents & educators to select these digital books with confidence. Our Synopsis: The story begins with the ancient forest full of prehistoric life. Soon a loud pounding sound can be hear in the distance and all the animals begin to hide. It is Tyrannosaurus Rex! She is bigger than most other dinosaurs and even bigger than the trees. 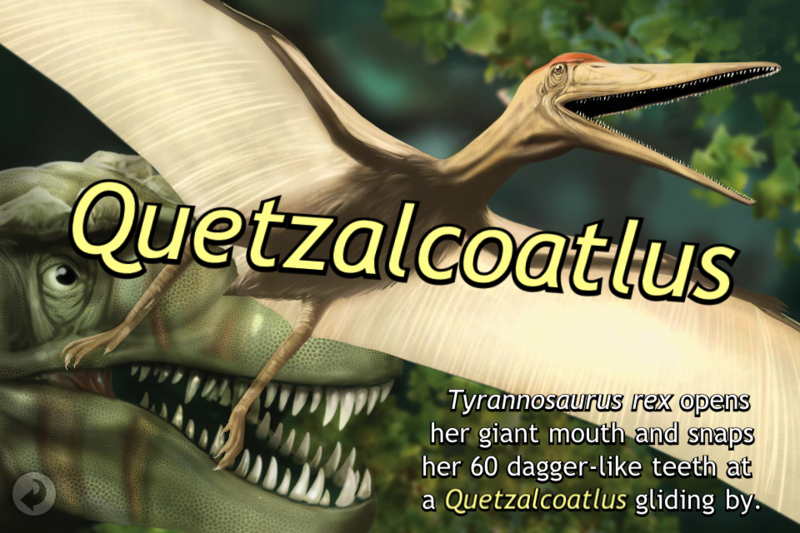 She tries to eat a nearby flying reptile but when she misses she heads into the forest for something that smells delicious ... while trying to eat a baby dino, she cracks her tooth on a jagged rock instead. Soon an even scarier sound can be heard in the distance, a volcano.